The objective was to evaluate the effect of pretreatments of CaCl2 and osmotic dehydration (OD) on oil absorption in plantain and cassava chips. Plantain and cassava slices (1 mm thickness and 35 mm diameter) were prepared. Pretreatment with and without 5% CaCl2 solution before applying OD with sucrose solutions at 30 and 45%, and NaCl at 3 and 6% in a product/solution ratio of 1:25, at 40 °C were employed. OD kinetics and diffusivity were estimated by Page’s model and Fick’s law, respectively. Best OD treatments for plantain chips were 45% sucrose with CaCl2 and 6% NaCl without CaCl2. However, for cassava chips, the best OD treatments were 45% sucrose without CaCl2 and 3% NaCl with CaCl2. Page’s model predicted the OD experimental results with an R2 = 0.94–0.97. Effective diffusivity of water (EDW) and effective diffusivity of solids (EDS) for osmo-dehydrated cassava samples, with and without CaCl2, decreased as the concentration of the osmotic solutions was increased. However, in general, the inverse effect was obtained for plantain samples for EDW and EDS. Use of CaCl2 when applying OD reduced EDW and EDS in plantain and cassava chips. In general, it was observed that when increasing the concentration of the osmotic solution, oil absorption capacity decreased. 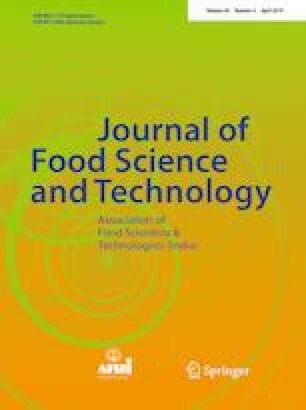 Treatments that showed the lowest oil absorption were 45% sucrose OD in plantain chips pretreated with CaCl2 (11.49%) and fresh cassava chips with 45% sucrose OD (10.72%). The results and effectiveness will depend on food, process conditions and type of osmotic agent. The authors appreciate the financial support of the National Council for Science and Technology (CONACyT) of Mexico, through Grant 179507 and the Grant 334838 awarded to D. Solís- Ulloa for his Master’s in Science studies.